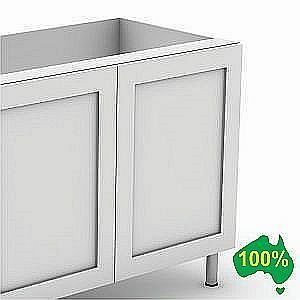 About Flat Pack Kitchens | DIY Kitchens Info Online | FlatPackKitchens AU . A versatile, colorful, Shaker or poly kitchens among others, can be designed to meet your particular preferences. 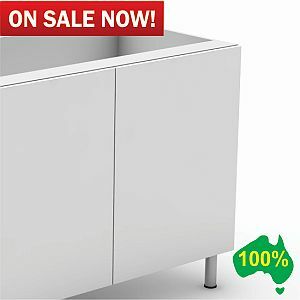 Our cheap flat pack kitchens are made from material supplied from Germany by Blum with a lifetime warranty and constructed by qualified Australian craftsmen in a wide and varied range of innovative designs. Our designer Flat pack kitchens are serviced by experienced Australian commitment and pride in an Australian product. Your Flat pack kitchens in Melbourne or versatile DIY kitchens are supported by our record for supplying durable, hard-wearing products that enhance any home or building, thus adding value to your investment. We have highly trained staff, experienced in all aspects of custom made kitchen cabinets and offer delivery Australia wide. Whether you are seeking Formica kitchens, laminate kitchens, or another type, we invite you to view some of the best designer kitchen cabinets and custom Flatpack kitchens available. Our products are easy to assemble, carcass materials of HRM (High Resistance to Moisture) boards, expertly crafted from the designs of experienced experts in creating cheap kitchen cabinets. At Custom Flat pack kitchens, we have an established reputation for producing of the highest quality, with recognized service excellence. The perspective we present to our customers regarding kitchen design whether related to Shadowline kitchens, Laminex kitchens, modern kitchens, or bargain kitchens, is more than just a place to prepare food, irrespective whether it is in a domestic or commercial environment. The concept of our products, including diy flat pack kitchens, is designed to provide a relaxing and influencing enhancement that can be looked upon, not only a financial investment but, in people. The kitchen is an asset that can affect lifestyles and act as a motivation towards increased productivity in all aspects of their lives. Innovatively designed Custom Flat pack kitchens or DIY kitchens are a source of pride in any environment and an influencing factor in a variety of forms. Our kitchen cabinets and flat pack kitchens are designed to meet your specific needs for not only practical convenience and accessibility but, also to enhance the tone and atmosphere that you want to create in your important kitchen area. Pride of ownership is an essential ingredient for all of us, in any design that involves kitchen cabinets and DIY flat pack kitchens. Not only is it reflected in the workmanship of our skilled craftsmen, but for you as the end user, for whom it can become a significant enhancement in appearance and for those who enjoy using it. Our dedication to meeting the needs of our customers is well established. At Custom Flat pack kitchens, we accept this as an ongoing and challenging task, as we believe that you have the right to receive the best possible product value for your investment. In the world of designer flat pack kitchens, trends and new perceptions demand new and innovative concepts and methods of manufacturing. You have pride in your home or business property and this is an inherent factor in any form of design. It calls for a combined effort from designers, manufacturers, and craftsmen to produce personalized flat pack kitchens in Sydney, or any other city in Australia. Custom Flat pack kitchens keep updated with the concepts of modern kitchen design and ensure that perceptions and customer needs are met. Whether related to DIY flat pack kitchens or cheap kitchen cabinets, we meet the reality of cutting-edge kitchen design. To achieve this, we have highly trained personnel who you can call upon to answer your questions, exchange ideas and who will provide solutions as necessary. Added customer support is provided by our management team regarding constructing any form of kitchen plan or model that has been viewed online, or in other media. 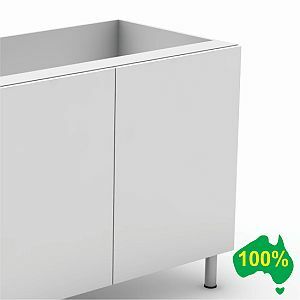 Our Custom Australian made kitchen cabinets and handle-less kitchen cabinets, as well as other products, are examples of the best in Australian workmanship and constructed of the highest quality materials from Blum, Germany. The appeal of our completed units and DIY kitchens is characterized by designer practicality, which is ensured by the continuous updating of our operational techniques and equipment. Our Custom Flat pack kitchens possess their own uniqueness in design, with a finishing process that allows for the exclusive needs of each installation. With our combined knowledge and experience, we have developed a practical understanding of consumer needs and their personal visions regarding kitchen cabinets and advantages such as seen in handleless kitchens. How you work in a kitchen area is an individual trait and therefore, the needs for delegating space can vary significantly. The flat pack kitchens in the majority of homes are a focal area in most family environments. As well as being a source of comfort and pride in investment, it is a place where people meet and communicate in a relaxed atmosphere. We therefore, pay great attention to creating and ensuring utilization of space, which will meet your requirements, as well as enhancing this important area and making it practical for your needs! As there are segments in flat pack kitchens, there are also segments in Kitchen cabinets. There are defined segments that are utilized for different functions, for example; space for consumables and non-consumables, or cleaning materials, food preparation and cooking and a lot more that meet personal requirements. How these special segments are created and where they are located, can make a significant difference. It can determine whether the area in bargain kitchens serves only as a kitchen, or does it become a place that assumes its own atmosphere and provides users with a special and unique environment! We are proud of our experienced and customer-friendly personnel, who willingly take the designing and producing of Custom Flat pack kitchens beyond the norm. It is our belief that fixtures such as kitchen cabinets must form part of the design that will provide a suitable and comfortable area for individuals and their regular habits. This is an aspect of kitchen design that entails a high degree of flexibility, knowledge and customer communication skills. The result will fully enhance the available space, give value and complete customer satisfaction. Whether you are considering new cheap flat pack kitchens, diy kitchens, or redesigning a kitchen, or looking for a new concept in custom made kitchen cabinets, we have the capabilities of providing you with the opportunity to create your dream diy kitchens in an innovative way that will make a significant difference to your lifestyle. With the best available and highly qualified designers, Blum materials and the support of our skilled Australian craftsmen, you can look forward to an original kitchen experience, of innovation and perception. A great kitchen design and Custom Flat pack kitchens with Kitchen cabinets made to suit your particular needs, are three of the main contributions that help to make your kitchen a special place in the home environment and, a place to be proud of! A great atmosphere can work wonders and that helps to make your kitchen part of an investment for the future. With our commitment to quality products and the dedication of our skilled craftsmen, no matter whether there are cheap kitchen cabinets in flat pack kitchens; your home is a special place and we can help enhance it. Your home is and probably will be your biggest and most valuable investment and it is also a special place for your family, in many respects. It is therefore, worthwhile considering enhancing it with the help of Custom Flat pack kitchens, because we have the experience and perception to make a difference in your lifestyle!